Five-year plan of Alfa Romeo had scheduled inauguration of the successor to 159 by 2012. However two years remained, the first concept art images have been arrived. Present image was published by the British car-magazine Auto Express. 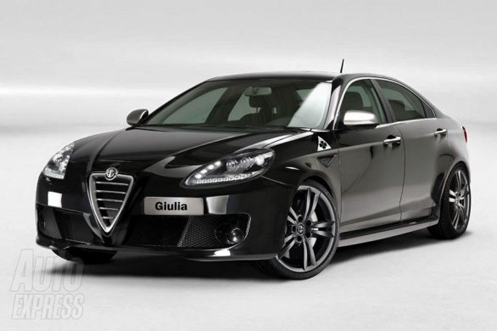 After the drafts committed with the usage of Photoshop, this is the first notable image of the new D-segment Alfa Romeo. British authors published the top-performance Quadrifoglio Verde version. Lateral air scoops of 8C are easy to recognise as well as headlights similar to Giulietta although these are scaled in a better way. Finally, there are the smoke-grey alloy wheels in consonance with the black polishing. According to Auto Express, the top-spec QV will be fitted with 3.3 litres Pentastar engines and MultiAir technology performing 306 HP through six gears and all-wheel-drive transmission. A new unit, christened Active Roll Control, will be introduced which tightens up the springs and dampers. The well-know switchable DNA system will also be installed. As for the petrol engines, 1.4 litres turbo unit with 120 HP of Giulietta is the smallest one, then its alter with 170 HP, however 1750 TBi with 200 HP could be fitted, too. The Dutch car-magazine AutoInternationaal considers a modified Q2 using a 1750 powerplant with 250 HP. Diesel engines could be 1.6 or 2 litres ones, with an output from 105 to 204 HP.